Home > Math really is child’s play! Did you enjoy maths at school? 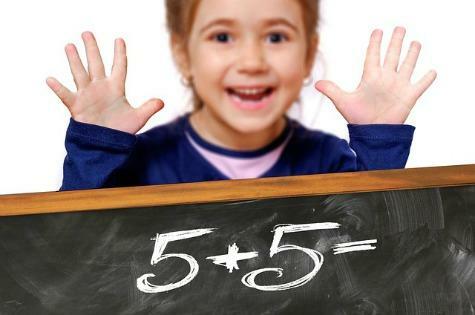 How confident are you at helping your child with maths? Maths is a fraught subject for many people in today’s world. But love it or hate it, it really is an unavoidable part of life – whether it’s paying bills, doing the household budget or even taking medication. We know that developing a child’s early maths skills is just as important as their reading. Research shows that children who start school behind generally stay behind, with those from disadvantaged backgrounds most at risk of not having the basic numeracy skills we all need. Yet many parents are uncertain about how to do this. There are myriad apps, computer games, activity books and toys that claim to improve children’s maths learning. But can we do without them? Can we help our children to understand and love maths without all of these expensive ‘add-ons’? Maths is everywhere. Opportunities to notice, explore and talk about maths with young children abound in our everyday life. We just need to recognise them as we go about our day. This is the approach I take in my work with The Smith Family’s Let’s Count program, which helps parents and early childhood educators build the maths skills of children aged three to five. Developed in particular to support children from disadvantaged backgrounds, the principles of the program can be used by every parent to bolster your child’s interest and confidence with maths. You can support your child’s mathematical understanding by doing such basic activities as shopping, cooking and bathing. All of these activities, and many more, are grounded in concepts such as number, measurement, volume, estimating and sequencing. The key, however, is to engage with your child while they play. Notice what they are doing, and their surroundings, explore the environment with them, and talk about what you are both doing as you play. When shopping, identify the items you need, how many or what size. Discuss ideas such as heavy, light, more, less, bigger, smaller. Count out the potatoes and weigh them. Compare sizes of pumpkins or milk bottles. The hardware store is another fantastic place for mathematical learning. Positional language such as high, low, over, under, on top of and through can all be used when finding items on the shelves, or moving from one space to another. Counting, estimating and predicting are also valuable concepts to explore – how many nails can we fit in this box? Will this paint tin be heavier or lighter than that one? I need four plants for the garden – you choose two and I’ll choose two, then we’ll have four. By engaging with your child and being ‘present’, your child’s understanding of the world around them grows. And we know from research that young children who are engaged in foundational maths in their home environment develop stronger skills and a positive attitude to maths. NOTICE – Notice the maths. It’s all around us! EXPLORE – Explore the world with your child: be curious, experiment, investigate. TALK – Talk it through together and ask lots of questions. Predict and Estimate: How many balls will fit in the jar? How tall will your structure be? Investigate and Reason: How do you know? Why do you think…? Explore Patterns: Do you see a pattern? Tell me about it. Can you dance your pattern? Explore Shapes and Space: Where have you seen this shape before? Can you tell me how to get to the shop from here? Count and Compare: How many do you see? Which is taller/shorter/longer? Which is bigger/smaller? All of these activities are simple and achievable as we go about our busy lives. Remember, families are children’s first and most influential teachers – and these early years are crucial! By engaging in play and discovery with your child, and making maths fun, you can make a long-lasting difference to their future learning and achievement. So let’s get playing, discovering and learning! Deb Ryan is the National Lead Facilitator for The Smith Family’s Let’s Count program. An educator, advocate, parent and grandparent, her passion is early childhood and the important role that parents play in young children’s development.